Ice floats and moves abouts. It melts in summer, it freezes in winter, but it moves from here to there driven by winds and currents. Some ice leaves the Arctic Ocean via Fram Strait to the east of Greenland and some leaves via Nares Strait to the west of Greenland. For the last 11 years I worked with Canadian friends in Nares Strait, but this summer I will work on the other side of Greenland with German, Polish, and perhaps Norwegian colleagues in Fram Strait. This opportunity already helps me solve puzzles in Nares Strait and more generally how ocean currents around Greenland impact ice cover, thickness, and flux. Jonathan Poole in 2012 with ice profiling sonar that was hit by ice. One of our many instruments measures the thickness of ice. 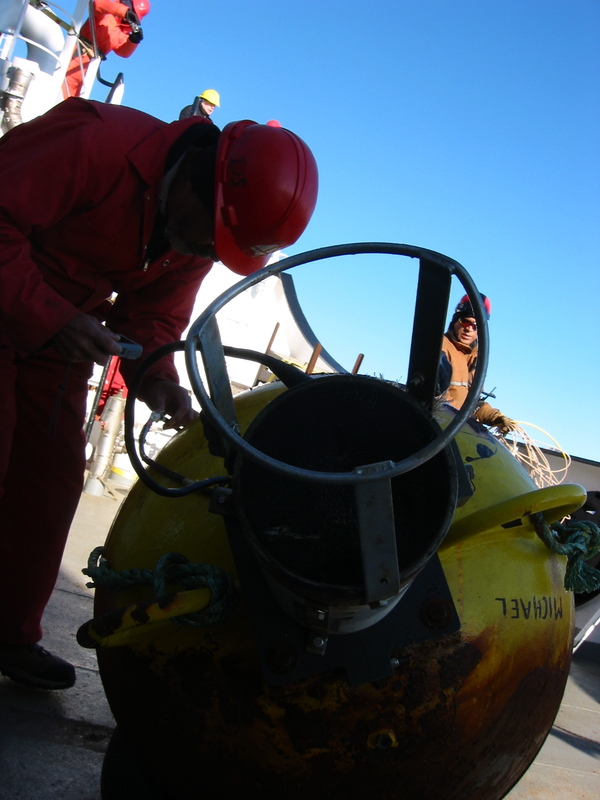 Our sensor package is moored on the ocean floor and quietly sends out a single ping every few seconds. Think of this ping as the sound you make when you tap your desk with a finger. The sound travels from the desk to your ear where you hear it, because your inner ear has a drum that picks up the vibrations that the taping makes when it hits your ear-drum. Well, our ice-profiling sonar sends out this ping that travels through the water to the ice above, bounces off the ice, and returns to our sensor. We then measure the time it takes for our ping to travel to the ice and back. If we know the speed of sound in the water, if we know the density of the water, if we know the pointing direction of the sonar, and if we know how much water is above our sensor, then we can estimate the thickness of the ice. The sketch below shows design details that go into keeping such a sensor system in the ocean recording data for 2-3 years at a time. Sketch of ice-profiling sonar mooring deployed on the bottom of the ocean. Design by Dr. Humfrey Melling of Fisheries and Oceans, Canada. 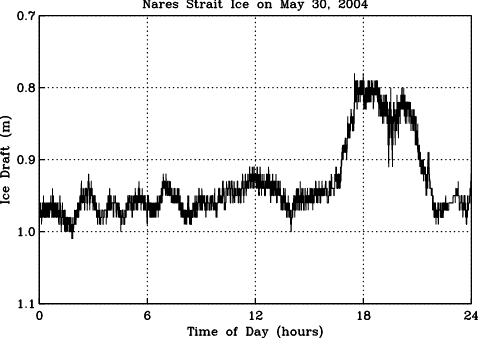 Ice draft below sea surface for May 30, 2004 in Nares Strait. Data shown are 15 second averages. 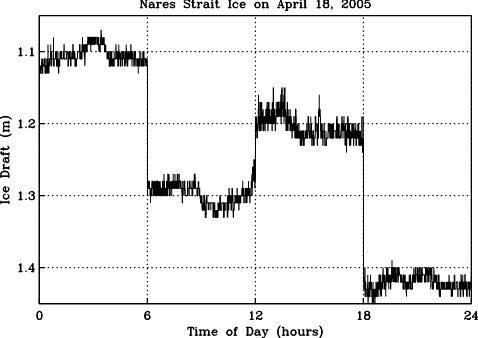 Ice draft below sea surface for April 18, 2005 in Nares Strait. The ice here is a little thicker, but not by much. What stands out are three funky looking, abrupt jumps every 6 hours precisely. How can this be? Well, it cannot and I must have done something bad to the data. Recall that we need speed of sound and water density estimates to convert acoustic travel time to ice draft. On April 18, 2005 my estimates perhaps were off. But why? And how can this be fixed? Vertically averaged sound speed for the month of April 2005. Black curve is for 6-hourly and blue curve is for 24-hourly estimates. For most of the month the speed of sound is about 1440 meters per second (m/s), but it spikes to almost 1446 m/s on April-18. It is this unrealistic spike that causes the estimated draft of the ice to go up and down by 20 to 30 centimeters. The second clue and likely fix to my “ice offset problem” is the blue curve in the above plot. Using the same fancy math, I there come up with an estimate of the speed of sound only once a day rather than once every six hours. There are still fluctuations, but they are much smaller without a big spike. So, to conclude, I pushed my fancy math too far and it crashed the same way that a flashy muscle car driven too fast will crash as either the car or the driver cannot handle the road anymore. I here crashed the car as physicists are prone to do. Ideally we do it in a safe environment such as crunching numbers on a computer … as I did here. 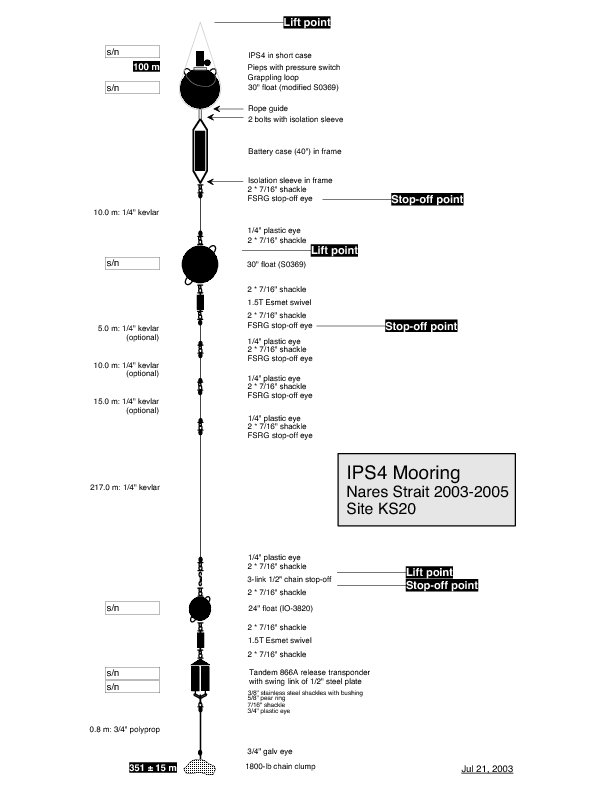 This entry was posted in Ice Cover, Nares Strait 2012, Oceanography and tagged Arctic Ocean, ice, moorings, Nares Strait, oceanography, physics, sonar, underwater acoustics. Bookmark the permalink.